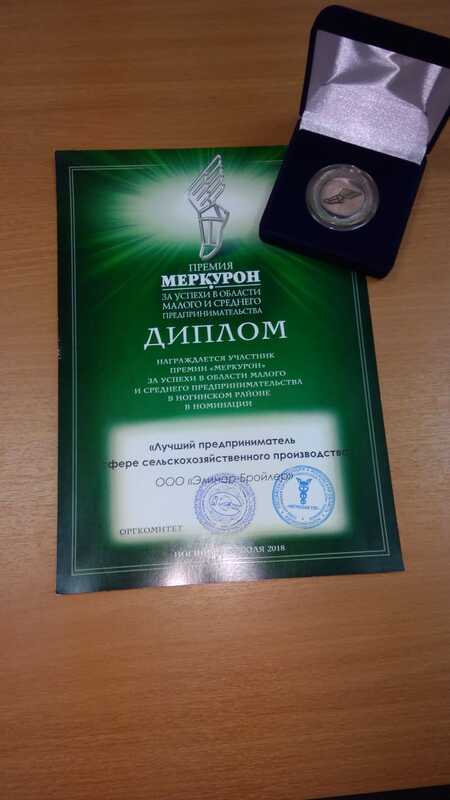 On July 10, 2018, the award ceremony of the second annual award “Mercuron” for the advances in small and medium enterprise of Noginsk region was held in “Gallery” restaurant of Noginsk. The main purpose of the award is a support and promotion of the business in Noginsk region as well as provision of the information about the goods and services of the local enterprising to the customers. The site of Elinar-Broiler LLC on growing of the parent stock is located in Noginsk region. In 2018, this plant was awarded by diploma of “Mercuron” in category “The best enterpriser in the agricultural production sphere”.